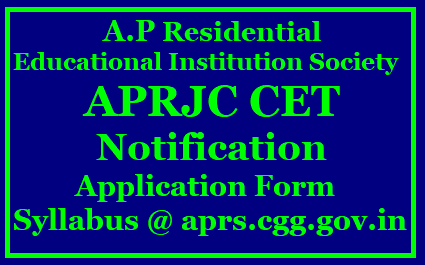 Aprjc is an state level entrance exam to join into residential junior colleges in Andhra pradesh. The Aprjc notification release in the month of March 2019. Once notification is released candidates can check updated information here. The eligible candidates can apply aprjc 2019 to get admission into residential junior colleges. Applicants can see below about eligibility, exam date, syllabus. Must be Indian national and studied in Andhra Pradesh. Candidates who are appearing ap 10th class exams March 2019 are eligible but candidates must pass in first attempt. Candidate should have passed SSC Examination in first attempt in APRIL/March 2019. Aprjc exam conducts in every districts’s headquarter, so candidates can choose their exam center while filling application form. Aprjc exam conducts for 150 marks and question paper contains 150 questions. Each question carries one mark and there is no negative marks hence candidates can answer all questions either know or don’t know the answer. Applicants must pay application fee 150 rupees while applying aprjc online application. Once application fee paid there is no refundable so carefully check all your details while paying application fee. The candidate after satisfying himself/herself about the eligibility criteria for the submission of application through online shall pay a fee of Rs.150.00 through online from 14.03.2019 to14.04.2019 for submission of application through Online.